In 800 B.C. the Greeks invented a unique process using beeswax and oil paint; Encaustic Painting. We developed a technique to adorn your photographs with organic beeswax and acrylic paint to create an archival work of art. WaxWorksPhoto was started by Susan Beard and Leah Macdonald. After studying fine art at Moore College in Philadelphia, Susan has continued to strive to push her work beyond the boundaries of a beautiful photograph. Over the years she has partnered with many wonderful photographers and artists. Leah became the brilliant artist behind WaxWorksPhoto; collaborating fine art photography and her unique process. She continues not only create new products such as Bliss Books, she also teaches corporate workshops and group classes. The process of building layers of organic beeswax over a photograph allows the ability to create a 3 dimensional texture. Then using paints in hues that compliment the image, the photograph takes on a more painterly feel; making it a one-of-a-kind encaustic painting. Take time for you, meet like-minded people, and get creative! Learned the ancient art of encaustic painting, dating back to 800BC. Starting with your own photo, renowned Philadelphia artist, Leah Macdonald, will teach you the magic of beeswax. If you're interested in learning more or inquiring about a private event, click HERE. Over the years we, as artists, have explored our own means of therapeutic art. By taking what we've learned and applying it in the corporate world, we have created a unique, unmatched team building experience. 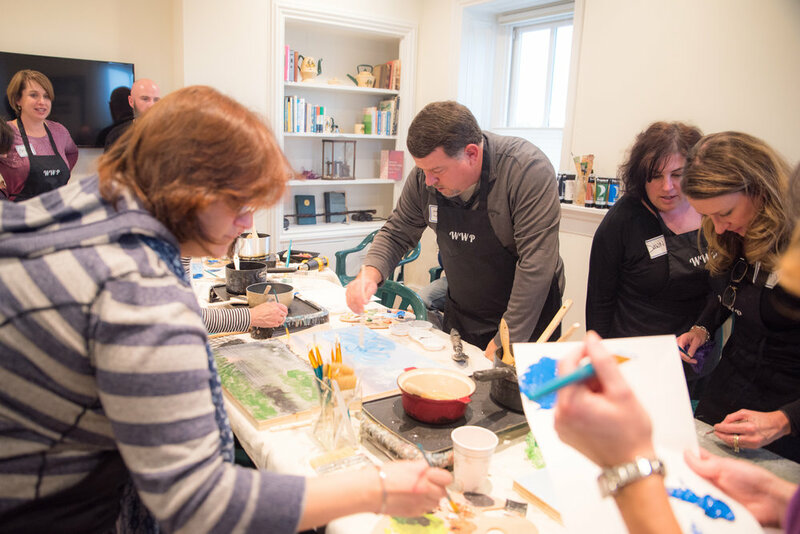 Click HERE to learn more about how this program can push your team to work together in an artistic and creative environment. Click HERE for our ordering page if you're familiar with the process. Otherwise scroll down to visit our FAQ section. If you're a photographer and are interested in purchasing wholesale products for your clients, click HERE to fill out our wholesale application. If you're already a registered wholesale client and need help ordering, call 215.483.1990.
together a little section of questions we get a lot. Click HERE to read through them. Or feel free to email Leah at info@susanbearddesign.com or call 215.483.1990 if you any questions not answered on this site!